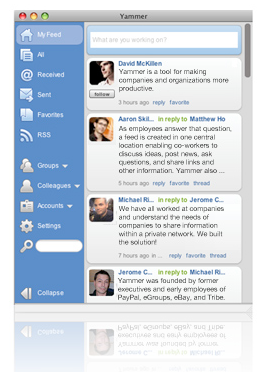 Yammer Completely Reworks Its Desktop Client. I Can Feel My Productivity Increasing Already. It’s been less than a year since Yammer made its debut at TechCrunch50 (and took the top prize), but the Twitter-for-businesses has already become absolutely essential to keeping TechCrunch going on all cylinders. And we’re not the only ones — Yammer is used by over 40,000 companies, and given the uproar caused when the service went down briefly last week, it’s clear that we’re not the only ones who rely on it heavily. But while Yammer as a service is great, its popular desktop client (from which most messages are sent) has left something to be desired: It’s been a fairly basic AIR app that lacks some of Yammer’s core functionality, like search and filtering through replies, and also looked a little clunky. But tonight, that changes. Yammer is releasing a new client that offers a slew of much-needed improvements, and looks much nicer to boot. The new client retain’s Yammer’s key features, updating with new posts from your colleagues as they come in. But it’s much sleeker, sporting an interface that reminds me of Tweetie, the slick Twitter client for Mac. The app now features integrated search, the ability to jump between Yammer accounts on the fly, improved notifications, spell-check, and support for viewing different threads in multiple windows. In short, if you use Yammer, you’re going to want to grab this ASAP.